One in every four deaths in the United States is caused by heart disease. The number of mortalities attributable to heart pathologies (598,607 in 2009) is more than the number attributable to all types of cancer combined. While heart disease does not seem to discriminate across ethnicities or gender, as it is the leading cause of death for men and women of most ethnicities, there are certain risk factors that can modify the chance of developing heart disease on an individual basis. These risk factors include inactivity (39.5% of individuals with heart disease have sedentary lifestyles), obesity (33.9%), hypertension (30.5%), cigarette smoking (20.8%), and high cholesterol (15.6%). Heart disease is an umbrella term that encompasses a variety of pathologies, one of which is heart failure. Heart failure is a condition in which the heart is unable to pump enough blood and oxygen to support the body’s organs. Heart failure can be induced by a multitude of biomechanical, hemodynamic, hormonal, and pathologic stimuli. Specifically, longstanding hypertension, myocardial infarction, coronary artery disease, valvular insufficiency and stenosis, myocarditis, and congenital malformations (to name a few) can activate disease pathways leading to heart failure. Excessive cardiac energy expenditure and workload leads to enlargement of the heart in an attempt to manage the increased blood flow demand. In healthy individuals, this is classified as "physiological" following exercise. When associated with cardiac damage, this compensatory mechanism is characterized as "pathological" hypertrophy. However, sustained hypertension ultimately leads to a decline in left ventricular (LV) function, a precursor to heart failure (Figure 1). Other causes of pathological hypertrophy are genetic mutations and ischemic damage that leads to myocyte death. Cardiac hypertrophy occurs in two ways. Concentric hypertrophy is caused by chronic pressure overload and leads to increased ventricular wall thickness with a decreased overall capacity, while eccentric hypertrophy is caused by volume overload and causes increased capacity yet thinning of the heart wall. Sarcomeres, the contractile unit, are added in series causing cell elongation with eccentric hypertrophy. In concentric hypertrophy, however, sarcomeres are assembled in parallel resulting in increased wall thickness. Along with this, there is an increase in cardiac fibroblasts with consequent fibrosis and increased ventricular stiffness. These alterations lead to increased overload and hypertrophy and jumpstart a sadistic cycle of cardiac enlargement and myocyte loss. The pressure and volume overload lead to hypertrophy through various signaling pathways, ultimately changing cell shape in an attempt to handle the heart’s increased demands. The following WIKI sections explore the variety of cellular cascades involved with pathologic myocardial hypertrophy and fibrosis. Hypertension produces a state of cardiac pressure-overload. In an attempt to manage this increased pressure demand, the heart enlarges in the form of concentric hypertrophy. In mice, aortic banding-induced pressure overload leads to cardiac hypertrophy and heart failure. Moreover, volume-overload specifically leads to eccentric hypertrophy. Ventricular volume overload leads to increased stiffness with concentric left ventricular. A study by Scheuermann-Freestone, et al. showed that shunt-induced volume-overload congestive heart failure (CHF) resulted in cardiac hypertrophy with compromised left ventricular hypertrophy in mice. Induced ischemia via coronary artery ligation of the left anterior descending artery in mice has been shown to produce myocyte death and eventual cardiac dysfunction. This occlusion of oxygen supply and nutrients to the heart initiates the heart-failure disease progression in humans, closely mimicking a heart attack. Transgenic mouse models have been used to investigate the overexpression of myotrophin as a cause of cardiac hypertrophy and CHF. Myotrophin is a protein that stimulates the growth of myocytes and protein kinase C (PKC) activity and interacts with nuclear factor κ-light chain-enhancer of activated B cells (NF-κB) proteins. It also enhances early proto-oncogenes and the expression of hypertophic marker genes in neonatal myocytes. When increased myotrophin induces significant overexpression of proto-oncogenes and hypertrophy marker genes in the heart, it can lead to hypertrophy and heart failure. Transgenic mice with this condition demonstrated a 9-month decline from cardiac hypertrophy to heart failure that included left ventricular hypertrophy, fibrosis, myocyte necrosis, pleural effusion, atrial dilation, and decreased ejection fraction. The changes in cardiac integrity and function observed in the transgenic mice was similar to those seen in a human heart affected by hypertension. The transgenic mouse model allows researchers to look at alterations in gene expression from initiation of hypertrophy through the progression to heart failure, which may help them identify a potential target for intervention. Intracellular alterations contributing to CHF include changes in sarcomeric protein function, extracellular matrix composition, calcium flow, and energy metabolism. Although more research is needed to support the exact mechanisms behind metabolic remodeling in heart failure, it is suggested that remodeling is a response to the increased energy demand of the cardiac muscles. Changes have been observed in mitochondrial function, high-energy phosphate content, and fatty acid oxidation in studies of hypertrophy and heart failure. These may be adaptations to increase production of ATP for energy. Mitochondria take up about 50% of the cytoplasmic space in the heart muscle cell. It is also important in the regulation of cardiac remodeling and in apoptosis. Causes of mitochondrial dysfunction contributing to cardiac failure include oxidative stress, acquired mutation, and fatty acid oxidation pathway impairments. Oxidative stress is caused by free radicals from oxidative phosphorylation and lipid oxidation. Mitochondrial DNA (mtDNA), which induce many genes responsible for oxidative phosphorylation, are likely to be damaged from the oxygen free radicals therefore limiting the production of ATP. Furthermore, these oxygen radicals in the heart interfere with sodium/calcium exchange, sodium-potassium ATPase, and calcium ATPase activities. Acquired mutations can also contribute to mitochondrial dysfunction. Maternally inherited point mutations in mitochondrial genes lead to defects in the mitochondrial respiratory chain and eventually CHF and cardiomyopathy. However it is unknown how the mitochondrial protein mutations contribute to these inherited cardiomyopathies. Furthermore if larger segments are deleted, which is thought to occur from spontaneous somatic mutations during development, impairments in cardiac conduction and the electron transport chain result. Animal models have been performed to study the connection between the mitochondria and cardiac function. A study with knockout mice investigating the effects of Tfam, a nuclear-coded mtDNA replication transcription factor, found that the surviving mice exhibited cardiac hypertrophy, ventricular chamber dilation, and conduction impairments. Another study looking at transgenic mice with PGC-1α overexpression found they displayed fibrosis, disruption of myofibrils, and an increased number of large mitochondria. Therefore, it can be concluded that there is an association between Tfam and PGC-1α in the mitochondria's role in cardiac remodeling. In the heart, the extracellular matrix is composed primarily of collagen type I and collagen type III, which are maintained within a specific ratio to promote efficient cardiac function. Maintenance of this ratio is achieved through a balance between rates of collagen synthesis and degradation. Diversion from the normal collagen type I/collagen type III ratio has been found in patients with cardiomyopathy and congestive heart failure. Matrix metalloproteinases (MMPs) and tissue inhibitors of metalloproteinases (TIMPs) are responsible for collagen turnover. Increased activity of MMPs cause increased degradation of the extracellular matrix, which can lead to ventricular dilation and congestive heart failure. More than 20 types of MMPs have been identified and classified into four main classes: collagenases, gelatinases, stromelysins, and membrane-type MMPs. Various MMP species found in the human myocardium are altered during heart failure. Specifically, MMP-1, MMP-2, MMP-3, and MMP-9 have been found to be upregulated during the remodeling process in human, rat, and porcine hearts. Genetics have been shown to play a large role in the development and presentation of hypertrophic cardiomyopathy (HCM). At least 13 genes have been linked to the disease, which is typically inherited as an autosomal-dominant trait. These genes encode sarcomere proteins, which are the contractile units of the cardiac myocytes. They include β-myosin heavy chain, cardiac myosin-binding protein C, cardiac troponin T, α-tropomyosin, cardiac troponin I, cardiac troponin C, cardiac α-actin, essential and regulatory myosin light chains, titin, α-myosin heavy chain, vinculin, muscle LIM protein, and telethonin. Most of the mutations are missense alleles, where one amino acid in the peptide formation is altered. The mutant peptides can then incorporate into the sarcomeres, affecting heart muscle function. The first genetic mutations causing HCM were identified in the β-Myosin heavy chain (MYH7) gene, which represents approximately 35% of all cases. Although disease prognoses vary depending on which of the 80 possible mutations is transcribed, approximately 90% of individuals with the MYH7 gene affected will exhibit significant myocardial hypertrophy by age 20 years. Life expectancies can vary from 45 years for individuals with the Arg403Gln mutation to near normal for those with the Val606Met mutation. The pathology associated with mutations of this particular gene is left ventricular wall thickening. Cardiac myosin-binding protein C (MYBPC3) helps regulate cardiac contraction in response to adrenergic stimuli. Mutations in this gene represent approximately 30% of HCM cases. Defects include missense mutations, splice mutations, insertions and deletions. The onset of cardiac hypertrophy tends to be later compared to MYH7 gene mutations. Cardiac hypertrophy often is not seen until age 40 or 50 years in those with the MYBPC3 gene affected. In general individuals with MYBPC3 mutations have a good survival rate, though one mutation is associated with increased risk of sudden cardiac death. Approximately 15% of HCM cases are attributed to mutations in the cardiac troponin T (TNNT2) gene. Defects include missense mutations, splice mutations, and deletions. Cardiac hypertrophy is less significant in individuals with TNNT2 involvement compared to those with myosin defects. However, those with TNNT2 mutations face decreased survival rates compared to those with other genes affected. α-tropomyosin (TPM1) mutations are less common causes of HCM, representing less than 5% of cases. A limited number of missense mutations have been identified for TPM1, but overall it has fewer variations in mutations compared to other genes. The degree of cardiac hypertrophy seen in carriers of TPM1 gene mutations varies. On average, individuals with these gene defects have near normal survival rates. Cardiac myocytes or cardiomyocytes, at the cellular level, are the location in which the phenomenon of cardiac hypertrophy takes place. The mechanism of hypertrophy is carried out via intracellular signaling pathways within these cells. 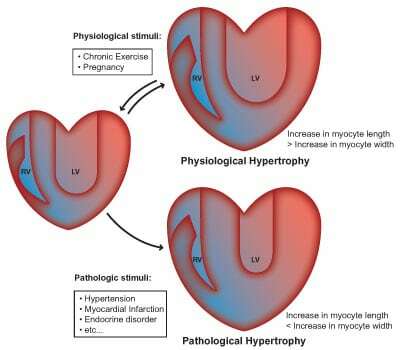 Myocardial hypertrophy is mediated by the extracellular molecules that are activated in response to stress and subsequently transduce the signals to intracellular molecules. In addition, there are several signal transduction cascades that been studied quite extensively and have been shown to play a significant role in the progression of cardiac hypertrophy. G protein-coupled receptors (GPCRs) are a large protein family that recognize extracellular molecules (i.e., ligands), activate intracellular activity, and ultimately initiate a cellular response. The GPCR is activated by an external signal in the form of a ligand or other signal mediator. The ligands particularly in the heart include hormones and neurotransmitters. When a ligand binds to the GPCR and is recognized, the GPCR makes a conformational (e.g., structural) change which mechanically activates the G protein. Myocardial GPCRs include adrenergic (comprised of α- and β-adrenergic receptor subtypes) and muscarinic receptors. These receptors are coupled to three principal classes of heterotrimeric GTP-binding proteins, Gs, Gαq/α11, and Gi,. These propogate the agonist- or antagonist-induced signal toward further internal effectors (i.e.,enzymes). All G proteins consist of Gα and Gβγ, subunits which upon activation dissociate and independently activate intracellular cascades. Research has demonstrated that cardiac myocyte hypertrophy occurs in response to stimulation by a variety of GPCR agonists. Catecholamines like noradrenaline, adrenaline, endothelin-1 (Endo-1), angiotensin II (Ang II) and IGF-I are hormones that bind to Gαq and initiate one of the primary pathways leading to hypertrophy. It is the activation of this pathway that is commonly responsible for induction of kinase cascades and transcriptional responses resulting in hypertrophy. GPCRs coupled to the Gαq/α11 subclass are also coupled to phospholipase Cβ (PLCβ). The cascade of activation subsequently activates diacyl glycerol (DAG), an intracellular ligand for protein kinase C (PKC). When PKC is active inositol-1,4,5-trisphosphate [Ins(1,4,5)P3] also becomes active, causing internal Ca2+ release via binding to the Ins(1,4,5)P3 receptor located in the endoplasmic reticulum or the nuclear envelope. This step that induces Ca2+ mobilization directly mediates hypertrophic signaling through activation of another pathway (e.g., calcineurin–NFAT) or by inactivation of calmodulindependent kinase (CaMK)–HDAC. Additionally, Gαq/α11 activity is an inducer of MAPK signaling in cardiac myocytes. Studies using transgenic mouse models confirm that Gαq/α11 coupling is a necessary event in the induction of pathological cardiac hypertrophy. Most stimuli that induce myocardial hypertrophy in neonatal rat models activate G-protein coupled receptors that regulate the G-protein Gαq. Research using transgenic mice supports this hypothesis demonstrating that Gαq-mediated signaling is both necessary and sufficient for the development of cardiac hypertrophy. Overexpression of the Gαq protein has been shown to be a factor in the development of cardiac hypertrophy. One study that supported this claim used transgenic mice overexpressing Gαq in the myocardium. 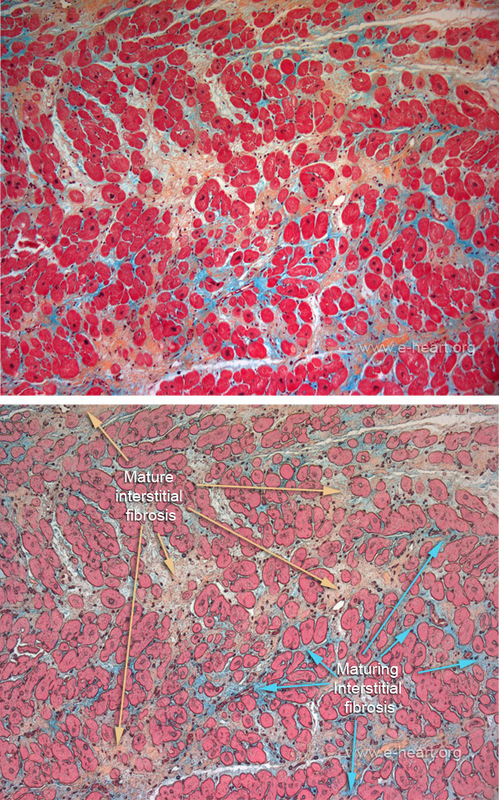 The mice developed cardiac hypertrophy in proportion to the extent of Gαq expression indicated by increases in cardiac mass, changes in left ventricular function and alterations in hypertrophic gene expression. In another study, a Gαq inhibitor peptide previously shown to prevent receptor coupling to Gαq was expressed in the myocardium of transgenic mice. Hypertrophy induced by pressure overload was significantly reduced in these animals. The β-adrenergic receptors are powerful regulators of cardiac contractile function. The most abundant adrenergic receptor in the myocardium is the β1-receptor, coupled to Gs. When initiated it activates adenylate cyclase (AC), eventually resulting in improved contractility and relaxation potential in the heart. Stimulation of these receptors thus increases heart rate and myocardial contractility via Gs coupling. Research using Gs transgenic mice have shown that hypertrophy was not evenly distributed among the Gs expressing cells but was prominent in regions where Gs expressing cells were concentrated and lacking in regions where Gs expressing cells were sparse. The overall suggestion is that Gs does not directly lead to cardiac hypertrophy and β-adrenergic/Gs induced hypertrophy may occur as a secondary response to the well-known contractile effects mediated via Gs signaling. There is incomplete research supporting the role of Gi signaling. Gi receptor coupling and activation may be due to the stimulation of receptors coupled to Gq by various hypertrophic growth factors. Additionally, overexpression of a Gi-coupled GPCR resulted in cardiomyopathy in one study implying that Gi-dependent signaling is sufficient to cause heart failure. However, the exact role is unclear and whether the role is direct or indirect. Various intracellular signaling pathways that are initiated by membrane-bound receptors responding to pathological or physiological stimuli have been implicated in the process of myocardial hypertrophy. The calcium-calmodulin-activated protein phosphatase calcineurin (PP2B) is an example of a pro-hypertrophic regulator in the heart. Calcineurin is a serine-threonine phosphatase that is activated by sustained elevations in intracellular calcium. Calcium plays an important role in the contractility and relaxation of the myocardium through coordinated release and sequestration from the sarcoplasmic reticulum. Increased concentration of calcium is associated with heart diseases. When the Ca2+-binding adaptor protein calmodulin becomes saturated with Ca2+, calmodulin binds directly to calcineurin, thus activating the protein. Once activated, calcineurin binds to and desphosphorylates members of the nuclear factor of activated T-cells (NFAT) transcription factor family in the cytoplasm of cells, which promotes their transcription into the nucleus. NFAT translocation into the nucleus activates various immune response genes in T-cells. The calcineurin-NFAT pathway is outlined in Figure 5. Several investigations using mouse models have shown that inhibiting calcineurin activity significantly reduces myocardial hypertrophy following pressure overload, which allowed researchers to confidently conclude that calcineurin-NFAT contributes to myocardial hypertrophy. The more interesting question, therefore, pertained to the role of the calcineurin-NFAT circuit in pathological versus physiological hypertrophy. A study by Wilkins et al. using a mouse model showed that the calcineurin-NFAT circuit is selectively implicated in pathological hypertrophy and not physiological hypertrophy. In this study, mice who were exposed to exercise demonstrated physiological hypertrophy without significant calcineurin-NFAT signaling while mice exposed to pressure overload for a prolonged period experienced increased calcineurin-NFAT signaling. The investigators postulated that, while exercise produces a temporary alteration in calcium handling that fails to activate calcineurin, pathological hypertrophy stems from continuous stimuli that induce a sustained calcineurin response that mobilizes NFAT factors. Multiple studies have examined calcineurin activity in hypertrophied and failing human hearts. These studies involved immunoprecipitation of calmodulin from tissue homogenates followed by calcineurin-specific western blots to identify the portion of calcineurin in the activated state. Significantly increases in calcineurin activation were observed in hypertrophied and failing hearts compared to controls, implicating calcineurin as a component of pathological myocardial hypertrophy and progressive human heart failure. Cyclosporine A and FK506 have been shown to be calcineurin inhibitors that can attenuate dilated and hypertrophic cardiomyopathy in rodent models. However, the therapeutic potential of calcineurin inhibitory agents for the management of maladaptive myocardial hypertrophy has not yet been determined. Currently existing calcineurin inhibitors have relatively toxic profiles and lack tissue specificity; immunosuppression and nephrotoxicity are common side effects. Additionally, inhibiting calcineurin would negate its beneficial regulatory roles as well as its pro-hypertrophic characteristics. Pro-survival or beneficial aspects of calcineurin include protection from ischemia-reperfusion injuries and apoptosis. Mitogen-activated protein kinases (MAPKs) are involved in numerous biological events including cellular proliferation, differentiation, survival and apoptosis by converting extracellular stimuli into a wide range of cellular responses. These responses are the result of signal transduction and regulation by four MAPK subfamilies including extracellular signal-related kinases (ERK1/2), c-Jun N-terminal kinases (JNK1, -2, -3), p38 kinases (α, β, γ, δ), and ERK5. Each group of MAPKs is a three-module cascade of phosphorylating kinases: a MAPKK kinase (or MAPKKK, MAP3K, MEKK), a MAPK kinase (or MAPKK, MAP2K, MEK), and a MAPK. The MAPK signaling cascade is initiated in cardiac myoctyes by G protein-coupled receptors (GPCRs), receptor tyrosine kinases (for growth factors such as IGF-1 and FGFR), receptor serine/threonine kinases (such as TGF-β), and by stress stimuli. When activated via phosphorylation, MAPKs then activate transcription factors that trigger reprogramming of cardiac gene expression. ERK1/2 regulates proliferation, transcription, differentiation, and cell death, among others. The MEKs (MAPKKs) in the ERK pathway are MEK1 and MEK2, and the MEKKs (MAPKKKs) are Raf kinase and MEKK1. The ERK pathway is primarily activated by growth factors and phorbol esters, but also G-Protein coupled receptors (GPCRs) and cytokines. Activation of the ERK pathway has also been linked with cell stretch and GPCR agonists (e.g., Ang II or ET-1). Growth factor binds to its respective receptor tyrosine kinase (RTK) and activates Ras, which then activates Raf (MAPKKK) at the plasma membrane. Subsequently, Raf phosphorylates and activates MEK1/2 (MAPKKs) which in turn activates ERK1/2 (MAPK) by phosphorylation. Activated ERK1/2 can then translocate to the cytoplasm or nucleus via phosphorylation, where it activates transcription factors that stimulate the transcription of genes increased in response to stimuli associated with hypertrophy, such as brain natriuretic peptide (BNP) and Elk-1. Finally, Elk-1 activates the serum response element (SRE) of the c-fos proto-oncogene associated with cancer and production of fibroblasts. The ERK1/2 pathway is regulated by phosphatases and negatively regulated by the other MAPKs, JNK and p38. Many studies have implied a role for the Ras/Raf/MEK1/ERK signaling pathway in promoting cardiac hypertrophy. In vivo, when the initial regulator Ras is overexpressed, subsequent pathological LV hypertrophy and premature death occurs. Furthermore, Zheng et al. observed fetal-gene induction and interstitial fibrosis following excessive Ras activation in transgenic mice, characteristic of hypertrophic cardiomyopathy. In short, Ras-Raf-MEK1-ERK1/2 pathway is generally regarded as a prohypertrophic and prosurvival pathway that can be a significant but not a necessary signaling component in cardiomyocyte hypertrophy. ERK5 is the final classic MAPK subfamily and the least studied; however, it shares similar biological roles as ERK1/2. ERK5 is activated in response to both growth and stress stimuli and follows the same cascade pathway as the other MAPKs. The most well-studied upstream MAP3Ks are MEKK2 and MEKK3, which activate the only known MAP2K, MEK5, which then phosphorylates and activates ERK5. Once activated, ERK5 can then relocate to the cytoplasm or nucleus, where it activates transcription factors that stimulate the transcription of genes involved in hypertrophy. JNKs and p38 MAPKs are activated mainly by stresses such as inflammatory cytokines, ischemia, oxidative stress, heat shock, and endotoxins. There are three known JNK isoforms, JNK1 to -3. Like ERK, JNK is involved in biological processes including cell proliferation, differentiation, apoptosis, cell survival, metabolism, and cytokine production, consequently playing a role in numerous pathologies and diseases. Along with stress, JNK is also activated secondarily by growth factors and GPCRs.18 Once stimulated, JNK is activated by the previously described three-tiered cascade. The MAP3Ks that activate JNKs are MEKK1, MEKK2, and MEKK3, as well as MLK2 and MLK3. These kinases then activate the MAP2Ks, MKK4, and MKK7. MKK4/7 then activates JNK via phosphorylation, at which time it can shuttle between the cytoplasm and the nucleus to wield its effects. JNKs are also able to phosphorylate the downstream target c-Jun and activate the N-terminal transcriptional activation domain of activating transcription factor-2 (ATF-2), consequently increasing transcriptional activating activity. Because it activates the transcription factor AP-1, the JNK/AP-1 cascade is considered to be involved in the increased expression of ANF, skeletal alpha-actin, TGF- β 1,Elk-1, p53 and collagen type I in cardiac hypertrophy. Via phosphorylation, JNK modifies the activity of numerous proteins that are housed within the mitochondria or act in the nucleus. The downstream molecules that are inhibited by JNK activation include NFAT4, NFATc1 and STAT3. By activating and inhibiting other small molecules in this way, JNK activity regulates several important cellular functions including cell growth, differentiation, survival and apoptosis. The role JNK plays in cardiac hypertrophy is less clear. While studies in vitro have suggested that JNKs are prohypertrophic, the majority of studies in vivo demonstrate the contrary; rather, JNKs appear to be more anti-hypertrophic, acting in part via excluding NFATs from the nucleus. The p38 module plays an important role in immune and inflammatory responses, promoting expression of pro-inflammatory cytokines such as IL-1 β, TNF- α, and IL-6, and other inflammatory related molecules and regulating the proliferation, differentiation, and function of immune cells. When deleted, p38α, the primary isoform involved in the inflammatory response, was found to reduce pro-inflammatory gene expression in epithelial cells. p38 also plays a role in apoptosis, cell survival, and cell growth, and is consequently involved in chronic inflammatory diseases, tumor genesis, and cardiovascular disease. Four different isoforms have been indentified: α, β, γ, δ. As a stress-activated kinase, p38 responds to most of the same stimuli as JNK and the pathway of p38 activation is the same as for ERK and JNK. MAP3Ks MEKK1 to -3 begin the pathway by activating the MAP2Ks. MKK3 and MKK6, both MAP2Ks, are said to be the primary protein kinases responsible for p38 activation, but MKK4 also has demonstrated activity. Activation of the p38 isoforms occurs via phosphorylation induced by MKK3 or MKK6. Upon stimulation, p38 isoforms phosphorylate numerous substrates in the cytoplasm and nucleus, including cPLA2, Bax, ATF-1/2/6, Elk-1, GADD153, and p53. Activated p38 MAPKs also can induce cardiac hypertrophy through the integrin-FAK-Src-Ras pathway. Along with this, EGF induces cardiac hypertrophy by activating Stat5 in conjunction with p38. On the contrary, inactivation of p38 is essential in the calcineurin-NFAT hypertrophic signaling process in which subsequently reduced p38 signaling causes myocyte. The expression of activated MKK3 or MKK6, the MAP2Ks within the p38 signaling pathway, has been shown to lead to developed heart failure, as evidenced by reduced functional performance, fibrosis and thinned ventricular walls (dilation), in transgenic mice but not hypertrophy. Although this activation did not lead to hypertrophy, it demonstrates promotion of cardiomyopathy and ultimately heart failure. Similar results have been found via the JNK pathway, in which MKK7-activated transgenic mice developed cardiomyopathy without hypertrophy. When activated, both the p38 and JNK pathway can negatively regulate hypertrophy by phosphorylating NFAT and decreasing or inhibiting the effects of calcineurin-NFAT signaling. Conversely, inhibition of p38 enhances cardiac hypertrophy by increasing calcineurin-NFAT signaling in mice51 and a similar effect was seen with inhibition of JNK1/2 signaling.Therefore, the stress-activated protein kinases p38, JNK1/2 might negatively regulate the cardiac hypertrophic response whilst inducing apoptosis and necrosis in cardiac myocytes. Tumor necrosis factor alpha (TNFα) is a cytokine found in cardiac myocytes and various other body systems. As a proinflammatory cytokine, once activated via stress signals it initiates an inflammatory response  TNFα also triggers intracellular signaling cascades that facilitate growth, survival in addition to promoting apoptosis and matrix metalloproteinase (MMP) expression. MMPs are a family of enzymes that degrade the extracellular matrix components and have been found to be increased in the failing human heart. Cardiac TNFα levels are elevated in heart diseases such as dilated cardiomyopathy, myocardial infarction, and left ventricular (LV) pressure overload. Hence, clinical and experimental studies have revealed an increase in serum concentration of tumor necrosis factor α (TNFα), as well as other cytokines, in heart failure patients. Hence, clinical and experimental studies have revealed an increase in serum concentration of tumor necrosis factor α (TNFα), as well as other cytokines, in heart failure patients. Generally, TNFα initiates a kinase cascade that results in the activation of the transcription factor NF-κB. Key intermediate mediators in this process include NF-κB-inducing kinase (NIK) and IκB kinase complex (IKK-α and IKK-β). , NF-kB is inactively located in the cytoplasm in bound to IkB, an inhibitory protein. The cascade is initiated when TNFα binds to TNFR, NF-κB inducing kinase (NIK) is activated. NIK then leads to activation of the IKK (IκB kinase) complex in which the signal-induced activation of IkB kinases phosphorylates IkBα, triggering subsequent IkBα degradation and NF-kB activation, leading to the translocation of NF-κB to the nucleus. Importantly, the phosphorylation and degradation of IκB proteins are key steps in NF-κB activation, translocation into the nucleus, and stimulation of gene expression. Therefore, NF-κB activation is able to induce cardiac hypertrophy in vivo. In addition, "the engagement of TNF receptor superfamily, member 1 (TNFR1) by TNF ligand leads to recruitment of the death domain–containing proteins TNFR1-associated via death domain (TRADD) and TNFR-interacting serine-threonine kinase 1 (RIP1), which can then participate in either complex I or complex II." Complex I binds to TNFR1 and induces both NF-κB and JNK activation. There is a critical balance between NF-κB and JNK activation, ultimately determining the fate of the cell. Complex II is present when TRADD and RIP1 are ubiquitinated and move into the cytosol. They then associate with Fas-associated death domain (FADD) and caspase-8. When complex I activates NF-κB, complex II mediates c-FLIPL, a caspase-8 inhibitor, allowing cell survival. However, when c-FLIPL is degraded, such as by JNK activation, and is absent from complex II, cell death occurs via caspase-8 and additional caspases such as caspase-3. Studies support the premise that NF-κB activation has an important role in myocyte hypertrophy. Cardiac hypertrophic agonists, such as angiotensin II and endothelin-1, stimulate this required NF-κB activation. A direct correlation has also been shown between ANG II and NF-κB activation. TNFα also activates AKT and JUN. Condorelli et al (2002) demonstrated that TNFα induces the phosphorylation of AKT and JUN kinase and the activation of NF-κB. They also showed that blocking AKT prevents NF-κB activation and that both AKT and JUN are critical for the development of TNFα-induced hypertrophy and apoptosis. Also in this study, the researchers found it important to clarify that the blocked combination of AKT, JUN, and NF-κB did not predispose myocytes to TNFα-mediated apoptosis, meaning that myocytes do not exhibit a sensitivity toward the pro-apoptotic effects of TNF-α. It has also been shown that myotrophin can initiate hypertrophy by increasing contractile protein synthesis. In a rat model, myotrophin was found to act on IKKα, dissociate the NF-kB complex, thereby allowing NF-kB to enter the nucleus and activate hypertrophy genes. Importantly, the whole cascade is protein kinase C (PKC) dependent. Moreover, NF-κB activation is necessary for myotrophin-induced hypertrophy via gene expression. Likewise, myotrophin activates NF-κB through the breakdown and phosphorylation of IκBα in cardiac myocytes to initiate hypertrophy. These findings suggest that the PKC–IKK–NFkB pathway has a potentially important role in mediating myotrophin-induced hypertrophy. However, the researchers acknowledged that further investigation is needed to determine myotrophin’s mechanism of action. In addition, TNFα–induced myocyte apoptosis can be mediated by oxidative stress or ROS. Reactive oxygen species (ROS) is a strong stimulus to induce NF-κB activity. On this premise, Li et al (2004) hypothesized and confirmed that antioxidants may inhibit NF-κB. The results concluded that the administration of the antioxidant PDTC (pyrrolidinedithiocarbamate) into aortic-banded rats significantly mitigated the development of cardiac hypertrophy in vivo with concomitant blunting of NF-κB activation. It has been suggested that developmental and physiological growth of the heart may be regulated by insulin or IGF-I. When ligand binding to IGF-I occurs, PI3K of the IA group (PI3Kα) is activated. When activated, PI3K converts plasma membrane lipid phosphatidylinositol-4,5-bisphosphate to phospatidylinositol-3,4,5-triphosphate, which in turn leads to the activation of other signaling components within the plasma membrane. PI3Kα is a heterodimer which is made up of p85 regulatory subunits and a p110 catalytic subunit. Certain GPCRs can lead to the activation of PI3K of the IB group (PI3Kγ) by recruitment of Gβγ catalytic subunit p110γ and p101 to the sarcolemma. In regards to regulation of myocardial hypertrophy, the ventricular function was preserved following physiological cardiac hypertrophy after the expression of active p110α occurred within the heart. During postnatal growth and after exercise in mice, the physiological hypertrophic response was inhibited by the myocardial expression of a dominant negative form of p110α. As a result of pressure overload, the pathologic hypertrophy response was unaltered. The sarcolemma recruitment of the AKT/PKB and phosphoinositide-dependent kinase-1 (PDK1) is initiated by the activation of PI3K. As a result of PDK1 and AKT/PKB being in close proximity of one another, PDK1 phosphorylates which leads to the activation of AKT/PKB. There are three AKT genes, however only AKT1 and AKT2 are highly expressed within the heart. In a "gain-of-function" approach, when AKT/PKB is activated, cardiac hypertrophy may be induced which is associated with preserved function (compensated hypertrophy). Conversely, in studies analyzing the effects of overexpression of AKT/PKB in mice found that the mice displayed signs and symptoms of cardiac dysfunction. When AKT/PKB overexpression was targeted within the nucleus in transgenic mice, there was no evidence of cardiac hypertrophy, but contained more cardiac myocytes, enhanced contractility, and were protected from ischemic injury. Signalling of AKT/PKB appears to be beneficial to the heart, when activated in an acute approach under physiological conditions or within the nucleus. Typically GSK3β is active and an important downstream target of AKT/PKB within the heart, however becomes inhibited by the AKT/PKB-mediated phosphorylation. Hypertrophic transcriptional effectors such as GATA4, β-catenin, c-Myc, and NFAT are negatively regulated by GSK3β when active. Overexpression of GSK3β when active blunts the hypertrophy in the heart with response to pressure overload and activated calcineurin and β-adrenergic stimulation. By activating mTOR, AKT/PKB may enhance protein synthesis. When inhibited, mTOR by rapamycin attenuates pathological cardiac hypertrophy and leads to myocardial dysfunction reversal. When AKT/PKB or PI3K are inhibited, it may not be beneficial to the heart therapeutically because they regulate physiological and adaptive hypertrophy, which would serve as an advantageous quality. Also, it remains unclear as to the exact effect of inhibition of AKT/PKB or PI3K to reduce pathological cardiac hypertrophy. When utilizing the IGF-I-PI3K-AKT/PKB-GSK3β-mTOR pathway therapeutically, it becomes challenging to understand the effects on the myocardium because each effector may have both adaptive and maladaptive influences on the myocardium. From a functional standpoint, the critical difference between physiological and pathological hypertrophy (as described in the Introduction) ultimately is the predisposition of pathological hypertrophy to progress to heart failure. Therefore, it is worth further investigating the relationship between the forms of hypertrophy in response to apoptotic stimulation and identify the molecular changes associated with each. One study found that only the cardiac myocytes made hypertrophic by pathological stimuli show increased sensitivity to apoptosis and the expression levels of various apoptotic modulators, meaning pathological stimuli that induce hypertrophy predispose the individual myocytes to apoptosis, causing alterations in the apoptotic molecules that lead to capitalization of the myocyte vulnerability. For example, in the Kang et al study, the exercise group which attained physiologic hypertrophy demonstrated a significant downregulation of caspases, an increased Bcl-xL-to-Bax ratio, and no changes in Fas. However, in pathological hypertrophy, Kang et al (2004) found that there were more diffuse proapoptotic changes, including changes in Fas, the Bcl-2 protein family, and caspases. These changes included a significant upregulation of caspases, a decreased Bcl-xL-to-Bax ratio, and an increase in Fas. The molecular changes associated with the types of hypertrophy show changes in caspases and Bcl-2 family members that favor survival in physiologic hypertrophy. Therefore, these differences may explain why pathological hypertrophy tends to progress to heart failure, whereas physiological hypertrophy does not, due to the heightened susceptibility of cardiomyocytes to apoptosis. These data add to the view that specific hypertrophic pathways are activated in physiological or pathological models of hypertrophy and may play a role in its propensity to undergo apoptosis. For further understanding, the critical proteins and molecules described above are defined. Death receptors are a class of cell membrane receptors belonging to the larger group of tumor necrosis factor (TNF) receptors. Members of this group comprise of Fas and TNFR1; associated ligands include Fas ligand (FasL), tumor necrosis factor-a (TNF-α), Apo-3L, and TNF-related apoptosis-inducing ligand (TRAIL) for Fas, TNF receptor 1 (TNFR1), death receptor 3 (DR3), and death receptor 4/5 (DR4/5). Fas mediates apoptotic cell death by FasL stimulation and the receptor activation provokes recruitment of adaptor proteins to the cell membrane subsequently leading to caspase activation. Caspases are intracellular apoptosis-associated proteases that drive the apoptotic process, specifically associated with the intrinsic cell death pathway. ) Inhibitor of apoptosis proteins (IAPs) are a class of anti-apoptotic proteins that prevent apoptosis. They act by direct inhibiting the caspase family and after TNFR stimulation subsequently modulating important survival mechanisms. Bcl-2 proteins are located on the outer membranes of the mitochondria, endoplasmic reticulum, and nucleus. This class of proteins that includes both proapoptotic (i.e., Bax) and antiapoptotic members (i.e., Bcl-2). The proapoptotic members (i.e., Bax) has been shown to interact with adenine nucleotide translocator (ANT) to induce the pore opening and subsequent cytochrome c release. Tumor necrosis factor (TNF) is molecule which has been implicated in the signaling pathways that mediate cardiac apoptosis. Evidence has demonstrated that the development of left ventricle wall thinning and adverse cardiac remodeling in mice with cardiac-restricted overexpression of TNF correlates with the prevalence of cardiac myocyte apoptosis. In addition, this study also showed that the prevalence of myocyte apoptosis increased along with an age-dependent decrease in the myocardial protein levels of Bcl-2, a critical member of the apoptosis-regulating protein family that suppresses cell death. Given that TNF enhances Bcl-2 degradation, the results suggested a role for TNF-induced activation of the intrinsic cell death pathway in the adverse cardiac remodeling. Specifically within the intrinsic pathway, Haudek et al (2007) indicates that in mouse hearts overexpressed with TNF, mitochondrial cytochrome c levels were significantly lower and cytosolic cytochrome c levels were significantly higher than the analogous cytochrome c levels in the control and Bcl-2 hearts. This is important because cytochrome c is involved in the initiation of apoptosis once released from the mitochondria into the cytoplasm in response to pro-apoptotic stimuli, where it activates capases that subsequently lead to cell death. Thus, the overexpression of Bcl-2 led to a significant reduction in the release of proapoptotic proteins and was sufficient to prevent mitochondrial cytochrome c release. In addition, the activation of the sympathetic nervous system and elevation of circulating catecholamines has been associated with the development of heart failure. Norepinephrine (NE), a catecholamine released during times of sympathetic nervous system activity, has also been found to have a role in cell death. NE has been shown to induce apoptosis in isolated adult rat ventricular cardiomyocytes through stimulation of the β-adrengergic pathway. Mann et al showed that NE provokes a direct effect on cardiac myocytes that is mediated by β-adrenergic receptor stimulation. Zaugg et al also demonstrated that it is the β1-adrenergic pathway that mediates the apoptotic response to NE. Reinforcing these results, Communal et al found that norepinephrine, by activation of the β-adrenergic pathway, stimulates apoptosis in adult rat cardiac myocytes in vitro. This is relevant because transgenic animals expressing β1-AdrR, even at low levels, develop heart failure associated with apoptosis.Thus, since sympathetic activity is increased in heart failure suggesting that prolonged or sustained levels of catecholamines may be destructive to cardiac myocytes. Adenine nucleotide translocator (ANT) proteins are localized on the inner mitochondrial membrane and play a key role in the exchange of cytosolic ADP for mitochondrial ATP. ANT interacts with several proteins of the mitochondrial outer membrane to form the “permeability transition pore” which is an important regulator of apoptosis. Opening of the pore leads to loss of the mitochondrial transmembrane potential which can result in outer membrane rupture, allowing the release of proapoptotic proteins such as cytochrome c and procaspases, both apoptosis-inducing factors. In a study by Hang et al, the role of adenine nucleotide translocator-1 (ANT1) in cardiac myocyte apoptosis during left ventricular hypertrophy was reinforced. In this study, apoptosis increased during early stages of hypertrophy that developed due to pressure overload which suggests that apoptosis is partly mediated by the upregulation of ANT1 mRNA expression. This supports previous research concluding that apoptosis is induced at an early stage of left ventricular hypertrophy in response to pressure overload and hypertrophied cardiomyocytes may be more prone to apoptosis. Condorelli et al also showed that pressure overload caused an increase in cardiac apoptosis, contributing to the transition from hypertrophy to heart failure, which may be associated with upregulation of Bax and reduction of Bcl-2 in cardiac myocytes. The results by Hang et al conﬁrm the ﬁndings of Condorelli et al and are consistent with the hypothesis that apoptosis contributes to the transition from left ventricle hypertrophy to heart failure. Thus, reduction of myocytes by the apoptosis process may cause loss of contractile force and gradual progression of systolic dysfunction which are common signs of heart failure. In addition to p38 MAP kinases, JNK (c-Jun N-terminal kinase) has been implicated as apoptotic mediators in other systems, together suggesting a relationship between stress-activated MAP kinase activation and ischemic injury. Thus, sustained or concurrent activation of stress-activated MAP kinase family members is required for development of apoptosis. Nuclear Factor kappa B (NFkB) plays a pro-survival and pro-apoptotic role in the cell, and the selection between these two cascades depends on signaling factors. One regulator of these cascades is JNK, through which too much or too little can be harmful to certain cells. Three negative regulators of JNK, either activated or increased by NFkB, include Ferritin Heavy Chain (FHC), Manganese SOD (MnSOD), and MAP kinase phophatase (MKP). FHC, involved in iron formation, is required to make free radicals. NFkB increases the gene expression of FHC and consequently inhibits ROS formation. TNF-α activates NF-κB and primes the binding of p50 and p65 to the promoter region of MnSOD gene, increasing MnSOD production. Increased MnSOD buffers ROS, thus negatively regulating its effects. Lastly, ROS suppress MKPs, inhibitors of JNK activation. If oxidative stress increases sharply and for prolonged periods, the ROS will increase and increase JNK activation. The role of JNK in cell death is two-fold. It inhibits cFLIP, a protein-deficient caspase homolog widely regarded as an inhibitor of apoptosis, or “brake” for caspase production. If this brake is released, an increasing amount of caspase will become available to drive apoptosis. The second role of JNK is to produce high levels of Bid, thus increasing the expression of Bax and Bad, the pro-apoptotic Bcl-2 family members, and reducing the protective effects of Bcl2. Ultimately the role of JNK activation in cell death is incomplete, despite the present research. Research using JNK knockout models are the most persuasive evidence that JNK and its signaling processes encourage apoptosis. In JNK1 and JNK2 double knockout mice, neuronal apoptosis is suppressed in the hindbrain, but increased in the forebrain, indicating that both JNK1 and JNK2 regulate region-specific apoptosis during early brain development. Lastly, apoptosis is induced by G protein-coupled receptor (GPCRs) stimulation in cardiac myocytes. Animal models studies with activated GPCR signaling pathways have determined that G-protein signaling has a role in apoptosis, linking an increase in neuro-hormones levels that activate GPCRs, the altered expression of G-proteins and their effectors, and the development of heart failure.. Studies using isolated cells or transgenic animal models in which GPCR signaling pathways are highly activated have implicated a role for G-protein signaling in apoptosis. This would provide a possible link between elevated levels of neurohormones that activate G-protein coupled receptors, the altered expression of G-proteins and their effectors, and the development of heart failure. Specific G protein subtypes have been associated with the cell death process, among these include Gαq, Gαi, and Gαs. The pathways responsible for Gαq-induced apoptosis are unclear. One pathway that has been implicated is the activation of the stress-activated kinases, p38 and JNK, which are enhanced in cells undergoing Gαq-induced apoptosis. In addition, the results by Leri et al suggest that the Gq-coupled AT1 receptor mediates activation of apoptotic pathways by mechanical stretch. While the initial hypertrophic response to Gq-coupled receptor stimulation in the stressed heart is adaptive, prolonged activation of these pathways may become maladaptive due to the collective loss of myocytes through apoptosis. Thus, these studies showed that sustained activation of Gαq induced marked apoptosis. In addition, prolonged elevated levels of Gαs signaling are commonly increased by catecholamines. The notion that increased Gs signaling can lead to apoptosis is further supported by studies demonstrating that heart failure and apoptosis develop in older transgenic mice overexpressing the alpha subunit of Gαs in the myocardium. Finally, further evidence has also linked a causal relationship between increased Gαi expression and the decreased contractile function associated with heart failure. However, increased Gi expression might be expected to decrease apoptotic signaling through protective effects of Gi signaling on activation of p38 kinase. Thus, while changes in Gαi function can clearly affect both hypertrophic and apoptotic responses, the role of Gi signaling in cardiomyocyte growth appears at present to be largely modulatory. Aforementioned, apoptosis is detrimental to the functional integrity of cardiac myocytes. Therefore, mechanisms have been put into place to counter such detriment. Inhibitors of apoptosis (IAPs) and cellular FLICE-like inhibitory protein (c-FLIP) are such molecules that prevent activation of the extrinsic pathway by blocking capase-8, a mediator of the apoptosis cascade. In addition, Bcl-2, major regulator of mitochondrial membrane permeability and an anti-apoptotic protein, prevents activation of the intrinsic pathway by inhibiting the release of cytochrome c. Several lines of evidence demonstrate that the proapoptotic JNK cascade ultimately induces apoptosis via the mitochondria-dependent pathway. Lamb et al. reported that JNK1 and JNK2 double knockout MEFs show increased sensitivity to TNFaplha-induced cell death, and that this increased sensitivity is due to defective JNK-mediated upregulation of c-IAP2. Finally, Yu et al. reported that JNK phosphorylates the Bcl-2 family protein BAD and inactivates its proapoptotic function. Collectively, these data suggest that under certain conditions, JNK can protect cells from apoptosis. Haudek et al conducted research to determine the role and relationship of Bcl-2 in apoptosis and whether it has the potential to modulate the effects of TNF. The researchers found that the overexpression of Bcl-2 in the heart prevents adverse cardiac remodeling, a decrease in contractile dysfunction, left ventricle thinning and TNF-induced myocyte apoptosis. Finally, heat shock proteins (hsps) offer a protective mechanism for the myocyte cell. Hsps expression is upregulated in healthy cells by many different stresses including heat and ischemia. Their functions include chaperoning protein folding and protein degradation. Specifically in the heart, studies have shown that prior hsp expression by a mild stress promotes subsequent protection against more severe stress. In cardiac animal cells in vivo and in vitro overexpression of distinct members of the hsp family produces a protective effect, thus demonstrating the ability of the hsps to invoke cardioprotection. Specific heat shock proteins implicated in such myocardial protection is hsp 27, 70, and 90. This occurs by specifically interfering with the caspase-mediated apoptotic cascade. Hsp27 has been shown to bind to cytochrome c and prevent it binding to Apaf-1, hsp90 binds to Apaf-1 and prevents it binding to cytochrome c, and hsp70 prevents oligomerised Apaf-1 from recruiting pro-caspase-9. It also appears that hsp70 can inhibit apoptosis in independent of capase inhibition. Evidence suggests that this is result of hsp70 inhibition of the c-Jun N-terminal kinase (JNK kinase) which as previously discussed has been found to induce apoptosis cell death. Several forms of cardiovascular stress that contribute to the development of cardiac hypertrophy, results in the activation of the sympathetic nervous system and increases the amount of plasma norepinephrine levels. Within the heart, it appears as though there is a direct correlation involving the activation of adrenergic receptors and cardiac hypertrophy, based on the increased NE levels in the plasma as well as observable effects of NE in vitro. The hypertrophic effects of NE seem to occur mainly through the activation of a1-adrenergic receptor (a1-AdrR). In an early study utilizing cardiac specific gene expression in transgenic mice, the researchers found that an activated mutant of the a1B-AdrR expressed in the mouse ventricle lead to mild cardiac hypertrophy. In another study that looked at cardiac hypertrophy induced by chronic NE infusion, resulted in attenuation by treatment with b-AdrR. It has been well known that ACE inhibitors, which block the formation of angiotensin II (Ang II), aid in the prevention of the development of pressure overload induced cardiac hypertrophy in both animal and human models. ACE inhibitors have also been found to affect other features of cardiovascular regulation including sympathetic tone. Receptor antagonists to Ang II have been shown to attenuate experimentally induced cardiac hypertrophy. Independent of the drug effects on blood pressure, the salutary effects of AT1 receptor blockers have been shown to occur. The exact role of the Ang II system in the regulation of cardiac growth continues to remain unknown. In transgenic mice, the overexpression of AT1 receptors within the myocardium resulted in cardiac hypertrophy. However, in AT1 knockout mice pressure overload and stretch triggered cardiac hypertrophy still occurred. There have been recent trials that have analyzed the effects of antihypertensive therapy and have shown that regression of hypertrophy is typically the result of improved systolic and diastolic performance and decreased incidence of heart failure. In the Heart Outcomes Prevention Evaluation (HOPE) trial, Ramipril (an ACE inhibitor) lead to a decrease of cardiac hypertrophy independently of its typical blood pressure lowering effects. The Losartan Intervention for Endpoint (LIFE) reduction in hypertension trial showed that the regression of left ventricular hypertrophy and lower rates of clinical endpoints were directly correlated. β-blockers have also have recently been shown to reduce ventricular remodeling, while improving the ejection fraction and it has a beneficial effect on mortality outcomes. Further research is warranted in order to determine and understand the potential pharmacological treatments for pathological cardiac hypertrophy. The level of interstitial fibrosis is closely related to the amount of left ventricular hypertrophy. As mentioned previously, extra collagen is deposited with equal level of myocyte hypertrophy in response to pressure overload. In these initial phases, collagen composition is normal with an enlarged ventricle. However, with long-term myocardial remodeling, there is a buildup of fibroblasts and extracellular matrix proteins, causing abnormal structure and function in the heart, resulting in the condition known as cardiac fibrosis. The mechanisms responsible for cardiac fibrosis in hypertrophy are not fully understood. However growth factors such as fibroblast growth factor-2 (FGF-2), transforming growth factor β (TGFβ), platelet-derived growth factor, and plasma hormones such as AngII, endothelin-1, and catecholamines, have been found to contribute to the regulation of this process. There are two forms of fibrosis: reactive interstitial and replacement. Reactive interstitial fibrosis occurs when there are widespread increases in extracellular matrix deposition at sites away from the site of focal injury. On the other hand, replacement fibrosis takes place when areas of myocyte loss are replaced with a structural scar. Fibroblasts are cells that produce many different types of matrix proteins and biochemical mediators, such as growth factors and proteases. They originate from either resident fibroblasts through proliferation and activation, endothelial cells, perivascular space of the cardiac vessels, or bone marrow-derived progenitor cells. Transforming growth factor-β (TGFβ) is a cytokine with many functions, including playing a role in cellular development, differentiation, and homeostasis. It has been shown to regulate extracellular matrix production in the heart according to results of studies with transgenic and knockout mice. Overexpression of TGFβ1 has been shown to be associated with cardiac fibrosis and hypertrophy. Similarly in human models, TGFβ has also been found to be upregulated in humans with a pressure-overloaded heart. Not only is it associated with cardiac fibrosis, TGFβ actually governs many signaling pathways in the regulation of cardiac fibrosis. These pathways will be briefly discussed in the following section, as most are not fully understood. Angiotensin II (Ang II) is the hormone with the most important role in cardiac fibrosis in hypertensive heart disease. It has been shown to work upstream of TGFβ in many studies. One in particular investigated whether Ang II would induce cardiac remodeling in TGFβ knockout mice. It directly induces NADPH oxidase activity, stimulating an increase in TGFβ and leading to fibroblast proliferation and differentiation into collagen-secreting myofibroblasts. Ang II also raises Smad2 levels and enhances the nuclear translocation of phosphorylated Smad3, which both lead to increased TGFβ signaling. Therefore, leading to cardiac fibrosis and hypertrophy. TGFβ binds to two types of serine/threonine kinase receptors; the type 2 receptor kinase phosphorylates the type 1 receptor. This then activates the Smad pathway. Smad proteins are a family of transcription factors that are subclassified into 3 groups: receptor-activated (Smads 1, 2, 3, 5, and 8), co-mediator (Smads 4 and 10), and inhibitory (Smads 6 and 7). Smad proteins are phosphorylated with receptor activation, associate with Co-Smad, and then translocate to the nucleus where they interact with transcription factors and coactivators to activate promoters. This allows them to have an effect on gene transcription since they are weak transcriptional factors acting alone. Smad-2 has been found to be phosphorylated to a greater extent in hypertension-induced heart failure. Smad 3 also interacts with KLF15 which is described in another pathway below. Rho signaling is initiated by TGFβ receptors and mechanical force. TGFβ promotes the nuclear translocation of myocardin-related transcription factor A (MRTF-A) through Rho/ROCK signalling in cardiac fibroblasts and this promotes a myofibroblast-like cell type through certain genes. In an animal study with aldosterone treated mice, cardiac fibrosis is associated with heightened levels of Rho kinase activity. Krupple-like transcription factors (KLF) are a large family of transcription factors with an important role in cell differentiation and tissue-development. Two of which, KLF15 and KLF5 are involved in cardiac fibrosis. As seen in Figure 10, KLF15 inhibits Smad3 activity on the connective tissue growth factor (CTGF) promotor. TGFβ down-regulates KLF15 in cardiac fibroblasts and myocytes which then leads to signalling of cardiac fibrosis. Therefore, KLF15 has been shown to be a negative regulator of cardiac fibrosis. These functions of KLF15 were supported in a study of KLF15 null mice, which found over expression of CTGF and significantly more collagen accumulation in the heart. The other Kruppel-like transcription factor, KLF5 is up-regulated through Ang II stimulation, thereby activating TGFβ expression. This pathway shows that it may be the connecting transcription factor between Ang II and TGFβ in the regulation of cardiac fibrosis. TGFβ also signals through TGFβ-activated kinase (TAK1) to activate ATF2 (activated transcription factor 2). Studies of transgenic mice with induced cardiac hypertrophy, fibrosis, and dysfunction have shown TAK1 overexpression. A study of mice with an induced cardiac mechanical load through aortic banding found that cardiac hypertrophy and the introduction of TGFβ1 were associated with increased TAK1 kinase activity in the heart. Therefore, increased TAK1 is directly correlated with cardiac hypertrophy and fibrosis. The connective tissue growth factor (CTGF) is a protein in the CCN family, whose name is the abbreviation of its main members' names. CTGF is mainly expressed in fibroblasts in the healthy heart but is also secreted by cardiac myocytes during cardiac remodeling. It is found in increased amounts in cardiac hypertrophy and heart failure and has been shown to contribute to the regulation of fibrosis. However, a mouse heart with CTGF overexpression did not have a fibrotic phenotype. Therefore, CTGF's role in fibrosis is unclear, specifically the identification of a specific CTGF receptor and whether it is activated directly or indirectly by TGFβ pathways, such as the Smads pathway. Four microRNAs (miRNA) are also important in the control of cardiac fibrosis: miR-21, miR-29, miR-30, and miR-133. Two of these, miR-133 and miR-30, play a role in mediating the upregulation of CTGF. In an animal model with rodents, there was a decreased expression of miR-133 and miR-30 which was inversely correlated with the amount of CTGF, collagen, and fibrosis. It is also known that both are expressed in cardiomyocytes to regulate CTGF levels, but miR-30 found in cardiac fibroblasts inhibits CTGF expression. Furthermore, a study with miR-133 knockout mice had severe fibrosis and heart failure. Another miRNA, miR-21 is the most strongly upregulated miRNAs in response to cardiac stress. It has been found to lead to fibroblast proliferation and fibrosis by way of upregulation in response to hypertrophy through increased ERK-MAP kinase signalling which was discussed earlier in this Wiki. Inhibition of miR-21 inhibits interstitial fibrosis and cardiomyocyte hypertrophy in response to thoracic aortic banding. The last miRNA known to be involved in cardiac fibrosis, miR-29 has been found to reduce collagen levels with overexpression and increase collagen amounts with knockout miR-29 models. Therefore, these miRNA are important in the regulating the amount of fibrosis in the heart. Heart disease is the leading cause of death in the United States and cardiac dysfunction affects millions of Americans. Myocardial hypertrophy and fibrosis are conditions that result in cardiac inefficiency and often progress to heart failure. A variety of interconnected signaling pathways respond to pathological stimuli, such as chronic hypertension or genetic mutations, which initiates hypertrophic cascades and apoptosis. Due to the prevalence of heart disease, much research has been devoted to developing pharmacologic interventions, such as ACE inhibitors, to manage its causes and symptoms. Further research is warranted to better understand the mechanisms leading to myocardial hypertrophy and fibrosis, as well as treatments to manage the conditions. 1. Heart disease facts. Centers for Disease Control and Prevention Web site. www.cdc.gov/heartdisease/facts.htm. Accessed January 21, 2012. 2. Kochanek KD, Xu J, Murphy SL, Minino AM, Kung HC. Deaths: Preliminary data for 2009. National vital statistics reports; vol 59 no 4. Hyattsville, MD: National Center for Health Statistics. 2011. 3. Heart failure fact sheet. Centers for Disease Control and Prevention Web site. www.cdc.gov/dhdsp/data_statistics/fact_sheets/fs_heart_failure.htm. Accessed January 21, 2012. 4. Hunter JJ, Chien KR. Signaling pathways for cardiac hypertrophy and failure. N Engl J Med. 1999;341:1276-1283. 5. Heineke J, Molkentin JD. Regulation of cardiac hypertrophy by intracellular signaling pathways. Nature Rev Mol Cell Biol. 2006;7:589-600. 6. Levy D, Garrison RJ, Savage DD, Kannel WB, Castelli WP. Prognostic implications of echocardiographically determined left ventricular mass in the Framingham Heart Study. N Engl J Med. 1990;322:1561–6. 7. Rajabi M, Kassiotis C, Razeghi P, Taegtmeyer H. Return to the fetal gene program protects the stressed heart: A strong hypothesis. Heart Fail Rev. 2007;12:331–43. 8. Wakatsuki T, Schlessinger J, Elson EL. The biochemical response of the heart to hypertension and exercise. Trends Biochem Sci. 2004;29:609–17. 9. Barry SP, Davidson SM, Townsend PA. Molecular Regulation of cardiac hypertrophy. Int J Biochem Cell Biol. 2008;40:2023-2039. 10. Woods KS, Townsend PA. Cardiac hypertrophy. Abcam Web site. www.abcam.com/index.html?pageconfig=resource&rid=11114. Accessed January 16, 2012. 11. Boluyt MO, Robinson KG, Meredith AL, et al. Heart failure after long-term supravalvular aortic constriction in rats. Am J Hypertens. 2005;18: 202–212. 12. Esposito G, Rapacciuolo A, Naga Prasad SV, et al. Genetic alterations that inhibit in vivo pressure-overload hypertrophy prevent cardiac dysfunction despite increased wall stress. Circulation. 2002;105:85–92. 13. Carabello BA. Models of volume overload hypertrophy. J Cardiac Fail. 1996;2: 55–64. 14. Scheuermann-Freestone M, Freestone NS, Langenickel T, et al. A new model of congestive heart failure in the mouse due to chronic volume overload. Eur J Heart Fail. 2001;3: 535–543. 15. Bayat H, Swaney JS, Ander AN, et al. Progressive heart failure after myocardial infarction in mice. Basic Res Cardiol. 2002;97: 206–213. 16. Gupta S, Das B, Sen S. Cardiac hypertrophy: Mechanisms and therapeutic opportunities. Antioxidants & Redox Signalling. 2007;9(6):623-652. 17. Exil VJ, Roberts RL, Sims H, McLaughlin JE, Malkin RA, Gardner CD, Ni G, Rottman JN, and Strauss AW. Very-longchain acyl-coenzyme a dehydrogenase deficiency in mice. Circ Res. 93: 448–455, 2003. 18. Cheng L, Ding G, Qin Q, Huang Y, Lewis W, He N, Evans RM, Schneider MD, Brako FA, Xiao Y, Chen YE, Yang Q. Cardiomyocyte-restricted peroxisome proliferator-activated receptor-delta deletion perturbs myocardial fatty acid oxidation and leads to cardiomyopathy. Nat Med. 10:1245–1250, 2004. 19. Li H, Wang J, Wilhelmsson H, Hansson A, Thoren P, Duffy J, Rustin P, Larsson NG. Genetic modification of survival in tissue-specific knockout mice with mitochondrial cardiomyopathy. Proc Natl Acad Sci USA. 97:3467–3472, 2000. 20. Lehman JJ, Barger PM, Kovacs A, Saffitz JE, Medeiros DM, Kelly DP. Peroxisome proliferator-activated receptor gamma coactivator-1 promotes cardiac mitochondrial biogenesis. J Clin Invest. 106:847–856, 2000. 21. Myocardial interstitial fibrosis. E-Heart.org Web site. http://www.e-heart.org/Pages/03_Cardiomyopathy/03_Cardiomyopathy_Interstitial_Fibrosis_001.htm. Accessed February 4, 2012. 22. Lopez B, Gonzalez A, Querejeta R, Larman M, Diez J. Alterations in the pattern of collagen deposition may contribute to the deterioration of systolic function in hypertensive patients with heart failure. J Am Coll Cardiol. 2006;48:89-96. 23. Li YY, McTiernan CF, Feldman AM. Interplay of matrix metalloproteinases, tissue inhibitors of metalloproteinases and their regulators in cardiac matrix remodeling. Cardiovasc Res. 2000;46:214-224. 24. Creemers EE, Cleutjens JP, Smits JF, Daemen MJ. Matrix metalloproteinase inhibition after myocardial infarction: a new approach to prevent heart failure? Circ Res. 2001;89:201-210. 25. Harvey PA, Leinwand LA. Cellular mechanisms of cardiomyopathy. J Cell Biol. 2011;194(3):355-365. 26. Chung M, Tsoutsman T, Semsarian C. Hypertrophic cardiomyopathy: from gene defect to clinical disease. Cell Research. 2003;13(1):9-20. 27. Ashrafian HA, McKenna WJ, Watkins H. Disease pathways and novel therapeutic targets in hypertrophic cardiomyopathy. Circ Res. 2011;109:86-96. 28. Creemers EE, Pinto YM. Molecular mechanisms that control interstitial fibrosis in the pressure-overloaded heart. Cardiovascular Research. 2011; 89:265-272. 29. Kabunde RE. Cardiac Myocytes and Sarcomeres. Cardiovascular Physiology Concepts. http://www.cvphysiology.com/Cardiac%20Function/CF020.htm. Updated 4/4/2007. Accessed 1/24/12. 30. Anan R, Greve G, Thierfelder L, et al. Prognostic implications of novel b-cardiac myosin heavy chain gene mutations that cause familial hypertrophic cardiomyopathy. J Clin Invest. 1994;93:280-285. 31. Fananapazir L, Epstein ND. Genotype-phenotype correlations in hypertrophic cardiomyopathy. Circulation. 1994; 89:22-29. 32. Gautel M, Zuffardi O, Freiburg A, et al. Phosphorylation switches specific for the cardiac isoform of myosin binding protein-C: A modulator of cardiac contraction? EMBO J. 1995;14:1952-1960. 33. Molkentin JD and Dorn GW. Cytoplasmic signaling pathways that regulate cardiac hypertrophy. Annu Rev Physiol. 2001;63:391–426. 34. Wilkins BJ, Dai YS, Bueno OF, et al. Calcineurin/NFAT coupling participates in pathological, but not physiological, cardiac hypertrophy. Circ Res. 2004;94:110-118. 35. Wilkins BJ and Molkentin JD. Calcium–calcineurin signaling in the regulation of cardiac hypertrophy. Biochem Biophys Res Commun. 2004; 322:1178–1191. 35. Ruwhof C, van der Laarse A. Mechanical stress-induced cardiac hypertrophy: mechanical and signal transduction pathways. Cardiovascular Research. 2000;47:23-37. 36. Frey N and Olson EN. Cardiac hypertrophy: the good, the bad, the ugly. Annu Rev Physiol. 2003;65:45-79. 37. Hurowitz EH, Melnyk JM, Chen YJ, Kouros-Mehr H, Simon MI, Shizuya H. Genomic characterization of the human heterotrimeric G protein alpha, beta, and gamma subunit genes. DNA Res. 2000;7(2):111–20. 38. Adams JW and Brown JH. G-proteins in growth and apoptosis: lessons from the heart. Oncogene. 2001;20:1626-1634. 39. D’Angelo DD. Transgenic Gαq overexpression induces cardiac contractile failure in mice. Proc Natl Acad Sci USA. 1997;94:8121–8126. 40. Adams, JW. Enhanced Gαq signaling: a common pathway mediates cardiac hypertrophy and apoptotic heart failure. Proc Natl Acad Sci USA. 1998;95:10140–10145. 41. Clerk A and Sugden PH. Activation of protein kinase cascades in the heart by hypertrophic G protein coupled receptor agonists. Am J Cardiol. 1999; 83:64H–69H. 42. Wu X. Local InsP(3)-dependent perinuclear Ca signaling in cardiac myocyte excitation-transcription coupling. J Clin Invest. 2006;116:675–682. 43. Akhter SA et al. Targeting the receptor-Gq interface to inhibit in vivo pressure overload myocardial hypertrophy. Science. 1998;280: 574–577. 44. Vatner DE, Yang G-P, Geng YJ, Asai K, Yun JS, Wagner TE, Ishikawa Y, Bishop SP, Homcy CJ. Determinants of the cardiomyopathic phenotype in chimeric mice overexpressing cardiac Gsa. Circ Res. 2000;86:802– 806. 45. Redfern CH, Degtyarev MY, Kwa AT, Salomonis N, Cotte N. Conditional expression of a Gi-coupled receptor causes ventricular conduction delay and a lethal cardiomyopathy. Proc Natl Acad Sci USA. 2000;97:4826–3. 46. Molkentin JD. Calcineurin-NFAT signaling regulates the cardiac hypertrophic response in coordination with the MAPKs. Cardiovasc Res. 2004;63:467-475. 47. Lim HW, Molkentin JD. Calcineurin and human heart failure. Nat Med. 1999;5:246-247. 48. Ritter O, Hack S, Shuh K, et al. Calcineurin in human heart hypertrophy. Circulation. 2001;103:670-677. 49. Rose BA, force T, Wang Y. Mitogen-activated protein kinase signaling in the heart: angels versus demons in a heart-breaking tale. Physiol Rev. 2010;90: 1507-1546. 50. Cargnello M, Roux PP. Activated and function of the MAPKs and their substrates, the MAPK-activated protein kinases. Microbiol Mol Biol Rev. 2011;75(1): 50-83. 51. Kyriakis JM, Avruch J. Mammalian mitogen-activates protein kinase signal transfuction pathways activated by stress and inflammation. Physiol Rev. 2001;81:807-869. 52. Pearson G, et al. Mitogen-activated protein (MAP) kinase pathways: regulation and physiological functions. Endocrinol Rev. 2001;22:153-183. 53. Heineke J , Molkentin JD. Regulation of cardiac hypertrophy by intracellular signaling pathways. Mol Cell Bio. 2006;7:589-600. 54. Ramos JW. The regulation of extracellular signal-regulated kinase (ERK) in mammalian cells. Int J Biochem Cell Biol. 2008;40:27072719. 55. Howe LR, Leevers SJ, Gomez N, et al. Activation of the MAP kinase pathway by the protein kinase raf. Cell. 1992;71:335-3432. 56. Kyriakis JM, App H, Zhang XF, et al. Raf-1 activates MAP kinase-kinase. Nature. 1992;358:417-421. 57. Goldsmith ZG, Dhanasekaran DN. G protein regulation of MAPK networks. Oncogene. 2007;26:3122-3142. 58. McKay MM, Morrison DK. Integrating signals from RTKs to ERK/MAPK. Oncogene. 2007;26:3113-3121. 59. Raman M, Chen W, Cobb MH. Differential regulation and properties of MAPKs. Oncogene. 2007;26:3100-3112. 60. Yazaki Y, Komuro I. Role of protein kinase system in the signal transduction of stretch-mediated myocyte growth. Basic Res Cardiol. 1992;(suppl 2):11-18. 61. Bogoyevitch MA, Glennon PE, Andersson MB, et al. Endothelin-1 and fibroblast growth factors stimulate the mitogenactivated protein kinase signaling cascade in cardiac myocytes: the potential role of the cascade in the integration of two signaling pathways leading to myocyte hypertrophy. J Biol Chem. 1994;260:1110-1119. 62. Sadoshima J, Qiu Z, Morgan JP, et al. Angiotensin II and other hypertrophic stimuli mediated by G protein-coupled receptors activate tyrosine kinase, mitogen-activated protein kinase, and 90-kD S6 kinase in cardiac myocytes: the critical role of Ca(2+)-dependent signaling. Circ Res. 1995;76:1-15. 63. Owens DM, Keyse SM. Differential regulation of MAP kinase signaling by dual-specificity protein phosphatases. Oncogene. 2007;26:3203-3212. 64. Whitmarsh AJ, Davis RJ. Transcription factor AP-1 regulation by mitogen-activated protein kinase signal transduction pathways. J Mol Med.1996; 74(10):589-607. 65. Hunter JJ, Tanaka N, Rockman HA,et al. Ventricular expression of a MLC-2v-ras fusion gene induces cardiac hypertrophy and selective diastolic dysfunction in transgenic mice. J Biol Chem. 1995;270:23173-23178. 66. Zheng M, Dilly K, Dos Santos Cruz J, et al. Sacrcoplasmic reticulum calcium defect in Ras-induced hypertrophic cardiomyopathy heart. Am J Physiol Heart Circ Physiol. 2004;286:H424-H433. 67. Ueyama T, Kawashima S, Sakoda T, et al. Requirement of activation of the extracellular signal-related kinase cascade in myocardial cell hypertrophy. J Mol Cell Cardiol. 2000;32:947-960. 68. Juntilla M, Li S, Westermarck J. Phosphatase-mediated cross talk between MAPK signaling pathways in the regulation of cell survival. FASEB J. 2008;22:954-964. 69. Hibi M, Lin A, Smeal T, Minden A, et al. Identification of an oncoprotein- and UV-responsive protein kinase that binds and potentiates the c-Jun activation domain. Genes Dev. 1993;7:2135–2148. 70. Kim S, Iwao H. Activation of mitogen-activated protein kinases in cardiovascular hypertrophy and remodeling. Jpn J Pharmacol. 1999;80:97-102. 71. Davis RJ. Signal transduction by the JNK group of MAP kinases. Cell. 2000;103:239-252. 72. Bogoyevith MA. The isoform-specific functions of the c-jun N-terminal kinases (JINKs): differences revealed by gene targeting. Bioessays. 2006;28:923-934. 73. Clerk A and Sugden PH. Cell stress-induced phosphorylation of ATF2 and c-Jun transcription factors in rat ventricular myocytes. Biochem J. 2007;325:801–810. 74. Whitmarsh AJ, Yang SH, Su MS, Sharrocks AD, and Davis RJ. Role of p38 and JNK mitogen-activated protein kinases in the activation of ternary complex factors. Mol Cell Biol. 1997;17:2360–2371. 75. Karin M. The regulation of AP-1 activity by mitogen-activated protein kinases. Philos Trans R Soc Lond B Biol Sci. 1996;351:127–134. 76. Wang Y, Su B, Sah V, et al. cardiac hypetrophy induced by mitogen-activated protein kinase kinase 7, a specific activator for c-Jun NH2-terminal kinase in ventricular muscle cells. J Biol Chem. 1998;273:5423-5426. 77. Ricci R, Eriksson U, Oudit G, et al. Distinct functions of junD in cardiac hypertrophy and heart failure. Genes Dev. 2005;19:208-213. 78. Hilfiker-Kleiner D, Hilfiker A, Castellazzi M, et al. JunD attenuates phenylephrine-mediated cardiomyocyte hypertrophy by negatively regulating AP-1 transcriptional activity. Cardiovasc Res. 2006;71:108-117. 79. Kyriakis JM, Avruch J. Mammalian mitogen-activated protein kinase signal transduction pathways activated by stress and inflammation. Physiol Rev. 2001;81: 807–869. 80. Kim C, et al. The kinase p38 alpha serves cell type-specific inflammatory functions in skin injury and coordinates pro- and anti-inflammatory gene expression. Nat Immunol. 2008;9:1019–1027. 81. Thornton T, Rincón M. Non-classical p38 map kinase functions: cell cycle checkpoints and survival. Int J Biol Sci. 2008;5: 44–52. 82. Cuenda A, Rousseau S. p38 MAP-kinases pathway regulation, function and role in human diseases. Biochim Biophys Acta. 2007;1773:1358–1375. 83. Derijard B, et al. Independent human MAP kinase signal transduction pathways defined by MEK and MKK isoforms. Science. 1995;267:682–685. 84. Meier R J, Rouse A, Cuenda AR, et al. Cellular stresses and cytokines activate multiple mitogen-activated-protein kinase kinase homologues in PC12 and KB cells. Eur J Biochem. 1996;236:796–805. 85. Cuadrado A, Nebreda AR. Mechanisms and functions of p38 MAPK signalling. Biochem J. 2010;429:403–417. 86. Aikawa R, Nagai T, Kudoh S, et al. Integrins play a critical role in mechanical stress-induced p38 MAPK activation. Hypertension. 2002;39: 233–238. 87. Rebsamen MC, Arrighi JF, Juge-Aubry CE, et al. Epidermal growth factor induces hypertrophic responses and Stat5 activation in rat ventricular cardiomyocytes. J Mol Cell Cardiol. 2000;32: 599–610. 88. Lim HW, New L, Han J, et al. Calcineurin enhances MAPK phosphatase-1 expression and p38 MAPK inactivation in cardiac myocytes. J Biol Chem. 2001;276: 15913–15919. 89. Braz JC, Bueno OF, Liang Q, et al. Targeted inhibition of p38 MAPK promotes hypertrophic cardiomyopathy through upregulation of calcineurin-NFAT signaling. J Clin Invest. 2003;111: 1475–1486. 90. Liao P, et al. The in vivo role of p38 MAP kinases in cardiac remodeling and restrictive cardiomyopathy. Proc Natl Acad Sci USA. 2001;98:12283-12288. 91. Petrich DB, et al. c-Jun N-terminal kinase activation mediates downregulation of connexin43 in cardiomyocytes. Circ Res. 2002;91:640-647. 92. Petrich BG, Molkentin JD, Wang Y. Temporal activation of c-Jun N-terminal kinase in adult transgenic heart via cre-loxP-mediated DNA recombination. FASEB. 2003;17:749-751. 93. Liang Q, et al. c-Jun N-terminal kinases (JNK) antagonize cardiac growth through cross-talk with calcineurin-NFAT signaling. EMBO J. 2003;22:5079-5089. 94. Kapadia S, Lee J, Torre-Amione G, Birdsall HH, Ma TS, Mann DL. Tumor necrosis factor-alpha gene and protein expression in adult feline myocardium after endotoxin administration. J Clin Invest. 1995;96: 1042–1052. 95. Sato H, Watanabe A, Tanaka T, Koitabashi N, Arai M, Kurabayashi M, Yokoyama T. Regulation of the human tumor necrosis factor-alpha promoter by angiotensin II and lipopolysaccharide in cardiac fibroblasts: different cis-acting promoter sequences and transcriptional factors. J Mol Cell Cardiol. 2003;35:1197–1205. 96. Li, Y. et al. NF-κB activation is required for the development of cardiac hypertrophy in vivo. Am J Physiol Heart Circ Physiol. 2004;287;H1712–H1720. 97. Sun M, Dawood F, Wen WH, Chen M, Dixon I, Kirshenbaum LA, Liu PP. Excessive tumor necrosis factor activation after infarction contributes to susceptibility of myocardial rupture and left ventricular dysfunction. Circulation. 2004;110:3221–3228. 98. “Matrix metalloproteinase.” Wikipedia.com. February 5, 2012. 99. Kassiri Z, Oudit GY, Sanchez O, Dawood F, Mohammed FF, Nuttall RK, Edwards DR, Liu PP, Backx PH, Khokha R. Combination of tumor necrosis factor-alpha ablation and matrix metalloproteinase inhibition prevents heart failure after pressure overload in tissue inhibitor of metalloproteinase-3 knock-out mice. Circ Res. 2005;97:380–390. 100. Condorelli G, Morisco C, Latronico MVG, Claudio PP, Dent P, Tsichlis P, Condorelli G, Frati G, Drusco A, Croce CM, and Napoli C. TNF-α signal transduction in rat neonatal cardiac myocytes: definition of pathways generating from the TNF-α receptor. FASEB J. 2002;16:1732–1737. 101. Hefti, MA and Harder BA. Signaling pathways in cardiac myocyte hypertrophy. J Mol Cell Cardiol. 1997;29(11):2873-92. 102. Napoli C, Quehenberger O, De Nigris F, Abete P, Glass CK, and Palinski W. Mildly oxidized low density lipoprotein activates multiple apoptotic signaling pathways in human coronary cells. FASEB J. 2000;14:1996–2007. 103. Ashkenazi A and Dixit VM. Death receptors: signaling and modulation. Science. 1998;281:1305–1308. 104. Chen Z, Hagler J, Palombella VJ, Melandri F, Scherer D, Ballard D, and Maniatis. Signal-induced site-specific phosphorylation targets IkB alpha to the ubiquitin-proteasome pathway. Genes Dev. 1995;9:1586–1597. 105. Passier R, Zeng H, Frey N, Naya FJ, Nicol RL, McKinsey TA, Overbeek P, Richardson JA, Grant SR, and Olson EN. CaM kinase signaling induces cardiac hypertrophy and activates the MEF2 transcription factor in vivo. J Clin Invest. 2000;105:1395–1406. 106. Shioi T, McMullen JR, Kang PM, et al. Akt/protein kinase B promotes organ growth in transgenic mice. Mol Cell Biol. 2002;22:2799–2809. 107. Haudek SB, Taffet GE, Schneider MD, and Mann DL. TNF provokes cardiomyocyte apoptosis and cardiac remodeling through activation of multiple cell death pathways. J Clin Invest. 2007;117(9):2692-2701. 108. Chang, L. The E3 ubiquitin ligase itch couples JNK activation to TNF alpha-induced cell death by inducing c-FLIP(L) turnover. Cell. 2006;124:601–613. 109. Purcell NH, Tang G, Yu C, Mercurio F, DiDonato JA, and Lin A. Activation of NF-κB is required for hypertrophic growth of primary rat neonatal ventricular cardiomyocytes. Proc Natl Acad Sci USA. 2001;98:6668–6673. 110. Gupta S, Purcell NH, Lin A, and Sen S. Activation of nuclear factor-kappaB is necessary for myotrophin-induced cardiac hypertrophy. J Cell Biol. 2002;159:1019–1028. 111. Purcell NH, Molkentin JD. Is nuclear factor kB an attractive therapeutic target for treating cardiac hypertrophy? Circulation. 2003;108:638-640. 112. Haunstetter A and Izumo S. Apoptosis: basic mechanisms and implications for cardiovascular disease. Circ Res. 1998;82:1111–1129. 113. Kubota T, Miyagishima M, Frye CS, Alber SM, Bounoutas GS, Kadokami T, Watkins SC, McTiernan CF, Feldman AM. Overexpression of tumor necrosis factor- alpha activates both anti- and pro-apoptotic pathways in the myocardium. J Mol Cell Cardiol. 2001;33:1331–1344. 114. Sun M, Chen M, Dawood F, Zurawska U, Li JY, Parker T, Kassiri Z, Kirshenbaum LA, Arnold M, Khokha R, Liu P. Tumor necrosis factor-α mediates cardiac remodeling and ventricular dysfunction after pressure overload state. Circulation. 2007;115:1398-1407. 115. Kawamuraa N, Kubota T, Kawanoa S, Mondena Y, Feldmanb AM, Tsutsuia H, Takeshitaa A, Sunagawaa K. Blockade of NF-κB improves cardiac function and survival without affecting inflammation in TNF-a-induced cardiomyopathy. Cardiovas Res. 2005;66:520-529. 116. Purcell NH, Molkentin JD. Is nuclear factor kappaB an attractive therapeutic target for treating cardiac hypertrophy?. Circulation. 2003;108:638–40. 117. Oudit G et al. The role of phosphoinositide-3 kinase and PTEN in cardiovascular physiology and disease. J Mol Cell Cardiol. 2004;37:449-471. 118. Cantley L. The phosphoinositide-3kinase pathway. Science. 2002;296:1655-1657. 120. Condorelli G et al. AKT induces enhanced myocardial contractility and cell size in vivo in transgenic mice. Proc Natil Acad Sci USA. 2002;99:12333-12338. 121. Matsui T et al. Phenotypic spectrum caused by transgenic overexpression of activated AKT in the heart. J Biol Chem. 2002;277:22896-22901. 122. Shiraishi I et al. Nuclear targeting of AKT enhances kinase activity and survival of cardiomyocytes. Circ Res. 2004;94:884-891. 123. Rota M et al. Nuclear targeting of AKT enhances ventricular function and myocyte contractility. Circ Res. 2005;97:1332-1341. 124. Antos C et al. Activated glycogen synthase-3β suppresses cardiac hypertrophy in vivo. Proc Natl Acad Sci USA. 2002;99:907-912. 125. Sanbe A et al. Reengineering inducible cardiac-specific transgenesis with an attenuated myosin heavy chain promoter. Circ Res. 2003;92:609-616. 126. Proud C, Ras. PI3-Kinase and mTOR signaling in cardiac hypertrophy. Cardiovasc Res. 2004;63:403-413. 127. Shiojima I et al. Disruption of coordinated cardiac hypertrophy and angiogenesis contributes to the transition to heart failure. J Clin Invest. 2005;115:2108-2118. 128. McMullen J et al. Inhibition of mTOR signaling with rapamycin regresses established cardiac hypertrophy induced by pressure overload. Circulation. 2004;109:3050-3055. 129. Shioi T et al. Rapamycin attenuates load-induced cardiac hypertrophy in mice. Circulation. 2003;107:1664-1670. 130. “Apoptosis.” Wikipedia.com. January 29, 2012. 131. Feurerstein GZ and Young PR. Apoptosis in cardiac diseases: stress- and mitogen-activated signaling pathways. Cardiovascular Res. 2000;45:560–569. 132. Wang Y, Huang S, Sah VP, Ross J, Brown JH, Han J, and Chien KR. Cardiac muscle cell hypertrophy and apoptosis induced by distinct members of the p38 mitogen-activated protein kinase family. J Biol Chem. 1998;273(4):2161-2168. 133. Communal C, Singh K, Pimente DR, and Colucci WS. Norepinephrine stimulates apoptosis in adult rat ventricular myocytes by activation of the β-Adrenergic Pathway. Circulation. 1998;98:1329-1334. 134. Hang T, Huang Z, Jiang S, Gong J, Wang C, Xie D, and Ren H. Apoptosis in Pressure Overload-Induced Cardiac Hypertrophy Is Mediated, in Part, by Adenine Nucleotide Translocator-1. Annals Clin & Lab Sci. 2006;36(1):88-95. 135. Kang PM, Yue P, Liu Z, Tarnavski O, Bodyak N and Izumo S.Alterations in apoptosis regulatory factors during hypertrophy and heart failure. Am J Physiol Heart Circ Physiol. 2004; 287:H72-H80. 136. Bishopric, N.H., Andreka, P., Slepak, T., and Webster, K.A. Molecular mechanisms of apoptosis in the cardiac myocyte. Curr Opin Pharmacol. 2001;1:141–150. 137. Foo, R.S., Mani, K., and Kitsis, R.N. Death begets failure in the heart. J Clin Invest. 2005;115:565–571. 138. Nagata S. Apoptosis by death factor. Cell. 1997;88:355–365. 139. Li P, Nijhawan D, Budihardjo I, Srinivasula SM, Ahmad M, Alnemri ES, and Wang X. Cytochrome c and dATP-dependent formation of Apaf-1/caspase-9 complex initiates an apoptotic protease cascade. Cell. 1997;91:479–489. 140. Engel, D., Peshock, R., Armstrong, R.C., Sivasubramanian, N., and Mann, D.L. Cardiac myocyte apoptosis provokes adverse cardiac remodeling in transgenic mice with targeted TNF overexpression. Am J Physiol Heart Circ Physiol. 2004;287:H1303–H1311. 141. Dimmeler, S., Breitschopf, K., Haendeler, J., and Zeiher, A.M. Dephosphorylation targets Bcl-2 for ubiquitin-dependent degradation: a link between the apoptosome and the proteasome pathway. J Exp Med. 1999;189:1815–1822. 142. Mann DL, Kent RL, Parsons B, Cooper G IV. Adrenergic effects on the biology of the adult mammalian cardiocyte. Circulation. 1992;85:790–804. 143. Leri A, Claudio PP, Li Q, Wang X, Reiss K, Wang Malhotra A, Kajstura J and Anversa P. Stretch-mediated release of angiotensin II induces myocyte apoptosis by activating p53 that enhances the local renin-angiotensin system and decreases Bcl-2-to-Bax protein ration in the cell. J Clin Invest. 1998; 101:1326-1342. 144. Zaugg M, Xu W, Lucchinetti E, Shafiq SA, Jamali NZ and Siddiqui MAQ. Circulation. 2000; 102:344-350. 145. Engelhardt S, Hein L, Wiesmann F and Lohse MJ. Proc Natl Acad Sci USA. 1999;96:7059-7064. 146. Petronilli V, Penzo D, Scorrano L, Bernardi P, Di Lisa F. The mitochondrial permeability transition, release of cytochrome c and cell death. Correlation with the duration of pore openings in situ. J Biol Chem. 2001;276:12030-12034. 147. Susin SA, Lorenzo HK, Zamzami N, Marzo I, Snow BE, Brothers GM, Mangion J, Jacotot E, Costantini P, Loeﬄer M, Larochette N, Goodlett DR, Aebersold R, Siderovski DP, Penninger JM, Kroemer G. Molecular characterization of mitochondrial apoptosis-inducing factor. Nature. 1999;397:441-446. 148. Teiger E, Than VD, Richard L, Wisnewsky C, Tea BS, Gaboury L, Tremblay J, Schwartz K, Hamet P. Apoptosis in pressure overload-induced heart hypertrophy in the rat. J Clin Invest. 1996;97:2891-2897. 149. Condorelli G, Morisco C, Stassi G, Notte A, Farina F, Sgaramella G, de Rienzo A, Roncarati R, Trimarco B, Lembo G. Increased cardiomyocyte apoptosis and changes in proapoptotic and antiapoptotic genes bax and bcl-2 during left ventricular adaptations to chronic pressure overload in the rat. Circulation. 1999;99:3071-3078. 150. Xia Z, Dickens M, Raingeaud J, Davis RJ, and Greenberg ME. Opposing effects of ERK and JNK-p38 MAP kinases on apoptosis. Science. 1995; 270:1326–1331. 151. Nakano H, Nakajima A, Sakon-Komazawa S, et al. Reactive oxygen species mediate crosstalk between NF-kB and JNK. 2006;13:730-737.
apoptosis during early brain development. Neuron. 1999;22:667–676. 153. Sabbah HN. The cellular and physiologic effects of beta- blockers in heart failure. Clin Cardiol. 1999;22:V16-V20. 154. Bohm M, Eschenhagen T, Gierschik P, et al. Radioimmunochemical quantification Gi alpha in right and left ventricles from patients with ischaemic and dilated cardiomyopathy and predominant left ventricular failure. J Mol Cell Cardiol. 1994; 26:133-149. 155. Lamb JA, Ventura JJ, Hess P, et al. JunD mediates survival signaling by the JNK signal transduction pathway. Mol Cell. 2003;11:1479–1489. 156. Yu C, Minemoto Y, Zhang J, et al.JNK suppresses apoptosis via phosphorylation of the proapoptotic Bcl-2 family protein BAD. Mol Cell. 2004;13:329–340. 157. Garrido C, Bruey JM, Fromentin A et al. HSP27 inhibits cytochrome c-dependent activation of procaspase-9. FASEB J.1999;13:2061–2070. 158. Bruey JM, Ducasse C, Bonniaud P et al. Hsp27 negatively regulates cell death by interacting with cytochrome c. Nat Cell Biol. 2000;2:645–652. 159. Pandey P, Saleh A, Nakazawa A et al. Negative regulation of cytochrome c-mediated oligomerization of Apaf-1 and activation of procaspase-9 by heat shock protein 90. EMBO J. 2000;19:4310–4322. 160. Beere HM, Wolf BB, Cain K et al. Heat-shock protein 70 inhibits apoptosis by preventing recruitment of procaspase-9 to the Apaf-1 apoptosome. Nat Cell Biol. 2000;2:469–475. 161. Gabai VL, Yaglom JA, Volloch V et al. Hsp72-mediated suppression of c-Jun N-terminal kinase is implicated in development of tolerance to caspase-independent cell death. Mol Cell Biol. 2000;20:6826–6836. 162. Park HS, Lee JS, Huh SH, Seo JS, Choi EJ. Hsp72 functions as a natural inhibitory protein of c-Jun N-terminal kinase. EMBO J. 2001;20:446–456. 163. Milano C, Dolber P, Rockman H, Bond R, Venable M, Allen L, Lefkowitz R. Myocardial expression of a constitutively active α1B-adrenergic receptor in transgenic mice induces cardiac hypertrophy. Proc Natl Acad Sci USA. 1994;91:10109-10113. 164. Zierhut W, Zimmer H. Significance of myocardial alpha- and beta-adrenoceptros in catecholamine-induced cardiac hypertrophy. Circ Res. 1989;65:1417-1425. 165. Linz W, Schaper J, Wiemer G, Albus U, Scholkens A. Ramipril prevents left ventricular hypertrophy with myocardial fibrosis without blood pressure reduction: a one year study in rats. Cardiovasc Pharmacol. 1992;20:S83-S90. 166. Paradis P, Dali-Youcel N, Paradis F, Thibault G, Nemer M. Overexpression of angiotensin II type I receptor in cardiomyocytes induces cardiac hypertrophy and remodeling. Proc Natl Acad Sci USA. 2000;97:931-936. 167. Devereux RB, Wachtell K, Gerdts E, et al. Prognostic significance of left ventricular mass change during treatment of hypertension. Jama. 2004;292:2350-2356. 168. Yusuf S, Sleight P, Pogue J, Bosch J, Davies R, Dagenais G. Effects of an angiotensin-converting-enzyme inhibitor, ramipril, on cardiovascular events in high-risk patients. The Heart Outcomes Prevention Evaluation Study Investigators. N Engl JMed. 2000;342:145-153. 169. Sabbah HN. Biologic rationale for the use of beta-blockers in the treatment of heart failure. Heart Fail Rev. 2004;9:91–7. 170. Brown RD, Ambler SK, Mitchell MD, Long CS. The cardiac fibroblast: Therapeutic target in myocardial remodeling and failure. Annu Rev Pharmacol Toxicol. 2005;45:657-687. 171. Krenning G, Zeisberg EM, Kalluri R. The origin of fibroblasts and mechanism of cardiac fibrosis. J Cell Physiol. 2010; 225:631-637. 172. Yoshimatsu Y, Watabe T. Roles of TGFβ signals in endothelial-mesenchymal transition during cardiac fibrosis. International J of Inflammation. 2011;1-8. 174. Schultz JEJ, Witt SA, Glascock BJ, et al. TGF-β1 mediates the hypertrophic cardiomyocyte growth induced by angtiotensin II. J Clin Invest. 2002;109:787-796. 175. Wang B, Haldar SM, Lu Y, et al. The Kruppel-like factor KLF15 inhibits connective tissue growth factor (CTGF) expression in cardiac fibroblasts. J Mol and Cell Cardiology. 2008;45:193-197. 176. Rosenkranz S. TGF-β1 and angiotensin networking in cardiac remodeling. Cardiovascular Research. 2004;63:423-432. 177. Duisters RF, Tijsen AJ, Schroen B, Leenders JJ, Lentink V, van der Made I et al. miR-133 and miR-30 regulate connective tissue growth factor: implications for a role of micro-RNAs in myocardial matrix remodeling. Circ Res. 2009;104:170–178. 178. Liu N, Bezprozvannaya S, Williams AH, Qi X, Richardson JA, Bassel-Duby R et al. microRNA-133a regulates cardiomyocyte proliferation and suppresses smooth muscle gene expression in the heart. Genes Dev. 2008;22:3242–3254.